Help celebrate by supporting meteorologist Drew Montreuil’s work to bring free, accurate, no-hype weather forecasts to the Finger Lakes! February 5th is the annual “National Weatherperson’s Day”, celebrating meteorologists around the world and their hard work. February 6th is the 10th Anniversary of the launch of my first weather website, Grotonweather.com! 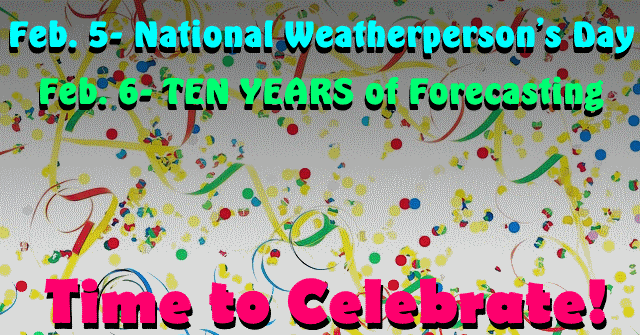 This milestone marks a decade of providing local forecasts for the Finger Lakes region. I began Grotonweather.com on February 6, 2006 with daily forecasts for Groton, Ithaca and Cortland. In the ten years since, I’ve earned both a Bachelors and Masters degree in meteorology, expanded my coverage to all of the Finger Lakes, and continually worked to improve my forecasts and communication of weather information. Each year, I spend approximately $500 to run flxweather.com and grotonweather.com. I have never charged for these services, as I want to ensure everyone has access to accurate, truthful forecasts, especially in bad weather. To offset these costs, I rely on advertisers on donations. This is only the second organized fund raiser I have done, and the first since 2014. I would greatly appreciate your donation to ensure many more years of this free service. If you are able, please consider making a one time or recurring donation using the panel located at the top of the left sidebar, or these easy-click buttons below! Please help me reach my goal of $500 by Sunday, February 7th! Thank you for your continued support! Please note that donations made using these buttons may not show up in the Fund Raiser statistics immediately, as they will need to be added to the total manually.